Dominarian time is tracked in Years Argivian Reckoning, named after the nation of New Argive. New Argive was a nation formed from the merging of Kjeld and Balduvia. Famed for it's universities and scholars, New Argive was one of the most powerful nations of the era. The first day of year 0 AR marks the birth date of Urza, a name most of you should recognize. 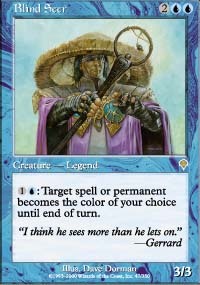 Urza's younger brother, Mishra, was born on the last day of the same year. The brothers were born into Argivian nobility, raised by a loving father, and a cold stepmother. When the boys were about 10 years old, their father became ill, and sent them to study under his friend, Tocasia, to help her with her archaeological research. It was through Tocasia that the brothers became introduced to the antiquities of the Thran Empire. The Thran Empire was an ancient one, ruling over the continent of Terisiare for many years. Ahead of its time, the Thran were the creators of very advanced and powerful artifacts. Over time, Urza became rather hands-off with the actually excavating, finding his talents were put to better use identifying and studying the uncovered artifacts. It was through the study of the ancient Thran artifacts that the boys themselves become very gifted artificers. In fact, you have those two to thank for the beloved Ornithopter. The otaku nerd in me can't help but picture Urza and Mishra as Edward and Alphonse during this time of their life. Sadly, these times were to be short lived, as a fateful journey to the Caves of Koilos would set the gears of war in motion. Beyond producing both black and white mana and allowing me to build some on my favorite casual decks, the caves are relevant for a few reasons. For starters, they're one of the last remnants of the Thran Empire that are still well in tact, housing many ancient artifacts from the era. Additionally, within the caves lies the only know permanent portal between Dominaria and Phyrexia. 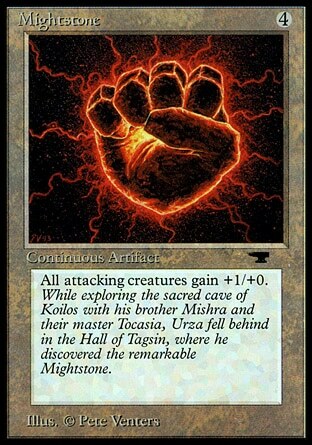 While on their first trip to the caves,Tocasia, Urza and Mishra happened upon two mysterious relics: the Mightstone and the Weakstone. Each brother took one stone, not knowing they were in place as a measure to stay shut the gates to Phyrexia. Over time, each brother began to desire the others stone, ultimately leading them to turn the power of their stones onto each other. In an attempt to end the duel, Tocasia put herself into the middle. As a result, both brothers lost control over their attacks, killing Tocasia in the process. 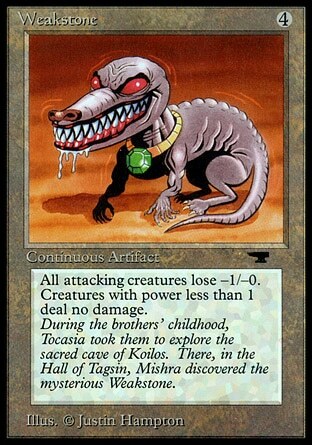 After this, Mishra disappeared into obscurity, while Urza traveled to Yotia to work as a clockmaker's apprentice. One day, the ruler of Yotia held a public contest, claiming that anyone who could move a giant Jade Statue from one end of his courtyard to the other could have his daughter's hand in marriage. It was brought to Urza's attention that this girl had in her dowry a Thran Tome. While the girl was of little interest to Urza, the tome certainty was, so he entered the king's contest. All participants of the contest failed, except for Urza. Using a giant machine he had created, Urza was able to move the statue, and marry Kayla bin-Kroog. However, being the focus-minded dog he was, even on their wedding night did Urza leave their bed to study the tome. Urza was now Chief Artificer of Yotia, and had spent years using this new position to further his research and abilities in artifice. This lead to creations like the Yotian Soldier, acting to replace humans on the battlefield. It was also around this time that Urza learned of Mishra's whereabouts. Mishra had become a close adviser to the ruler of the Fallaji desert people. Sneak attacks and fowl play between the two brothers, still after the others stone, eventually led to all out open warfare between the two nations they represented. Ultimately, both brothers finally reunited face to face on the battlefield, leading their respective armies. It was here that Urza realized his brother had been corrupted by Phyrexian influences, replacing much of his body with dark artifice. In response to this revelation, Urza activated the power of the Golgothian Cylex. The cylex was engraved with runes, basically reading "Click here to restart planet.". 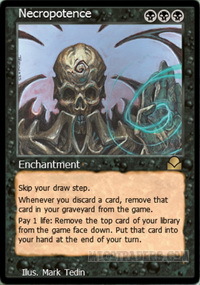 Upon activating the cylex, a massive burst of magic laid waste to both armies, killing everyone, except Urza. Instead of killing him, the power of the cylex activated Urza's planeswalker spark, causing him to ascend. The ramifications of the blast were not so light, as it was this single attack that sent Dominaria into the Ice Age. In his grief, Urza left to find what information he could on Phyrexia, in the hopes of avenging his brother. He entrusted his good friend and student, Tawnos, with telling his wife goodbye, and to remember him not for who he was, but for who he wanted to be. Urza is gone, and the world is covered in ice. During this time period nearly all of the early civilizations of Dominaria have been wiped out, and new kingdoms are rising to power in this frigid climate. You may recall the city of Krov that I discussed in my previous lore article. Krov was a great city during the Ice Age, renowned for its elementalists, unaware of the terrible fate that awaited it. 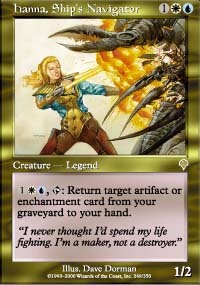 During this time, Lim-Dul the Necromancer unleashed waves of undead across the lands, planeswalkers plotted against each other, and ultimately, the planeswalker Freyalise succeeded in casting The World Spell, finally ending the Ice Age. The World Spell put into effect The Thaw, which in itself was nearly as destructive as the Cylex Blast that started the Ice Age to begin with. With The Thaw, many civilizations fell, and many new ones rose to power. Centuries have passed. Dominaria has undergone plague, pestilence, catastrophe, famine and war, and the planeswalker Urza is nowhere to be found. 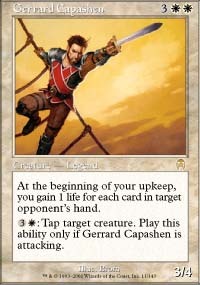 During this time, Urza had been using his newfound planeswalking abilities to track down Phyrexia, and take revenge for what they did to Mishra. He had been having difficulty, however, as despite his efforts he could not locate the plane. While Urza was out hunting down Phyrexia, Phyrexia was working on its own schemes. There exists Nine Spheres of Phyrexia, or Nine Circles of Hell if you will. On the Fourth Sphere, the Fane of Flesh, hundreds of Phyrexian sleeper agents were created. These agents were trained to be spies, sent to Dominaria, and were to pass as humans until activated. 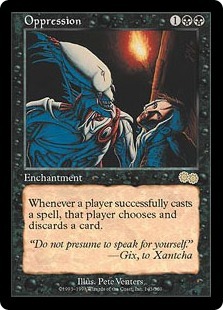 One such spy was named Xantcha, created and placed under the watch of Gix, the Phyrexian preator. Xantcha, however, was created with one fatal defect: freedom of thought. All sleeper agents were created to be under Yawgmoth's complete control, and when it was discovered that Xantcha was not under this influence, she was sentenced to death. 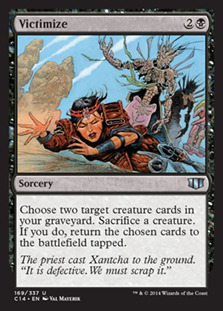 Xantcha, and a group of Phyrexian soldiers, were transported to a different plane to carry out the execution. As luck would have it, this was the same plane that Urza happened to be located on at the time. He was able to make quick work of the soldiers, and rescued Xantcha in return for her giving him the location of Phyrexia. With this knowledge, Urza and Xantcha rode a massive dragon engine headlong into the plane, breaking their way all the way to the fourth sphere. At this point, however, Urza found himself overwhelmed by the Phyrexian defenses, and was forced to retreat with Xantcha to Serra's Realm. Urza and his companion were welcomed in Serra's realm, however Serra was unable to use her white magic to heal Xantcha's wounds, due to her Phyrexian body. 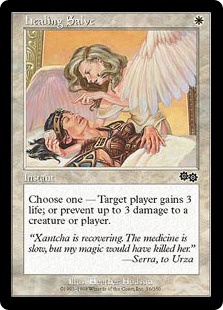 Xantcha was able to recover on her own, and thanks to medicine provided by Serra. Urza and Xantcha spent the next five years in Serra's realm, both to heal, and to learn what they could of the plane. Urza was able to learn about artificial planes in general, notably finding that they required either a planeswalker, or being of equivalent power to hold the plane together. After this five year stay, Phyrexia finally located Urza, and invaded Serra's realm. The invasion destroyed much of the plane, as well as infecting it with black mana and Phyrexian influence. Urza and Xantcha returned to Dominaria, while Serra fled her plane, leaving Radiant, Archangel to lead. Radiant was Serra's head general, and as such she took a very militaristic approach to leading her people. Over time, Radiant's paranoia of Phyrexian corruption would increase, and witch hunts would be lead to purge the realm of those considered to be in league with Phyrexia, whether they were or not. Back on Dominaria, Urza became stricken with increasing dementia. Yawgmoth had made his way into Urza's mind, and was driving him mad. In an attempt to break him free of this torment, Xantcha located a slave by the name of Ratepe who looked nearly identical to Mishra. 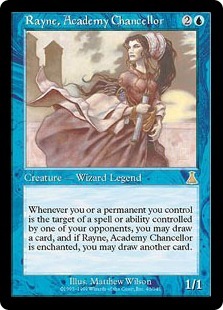 She paid for his freedom and brought him back to Urza. With Ratepe's help, Urza was finally able to restore his own sanity, and break free of Yawgmoth's mental link. However, a new threat would arise, as it was soon learned tha the preator Gix had arrived on Dominaria. Urza and Gix met at Koilos to battle to the death. The battle raged with neither combatant seeming to have an advantage. As time passed, however, Gix was able to gain the upper hand, putting Urza in a bad spot. As Xantcha and Ratepe watched the duel between the planeswalker and the demon, they knew the only way to end this, and prevent a Phyrexian invasion, would be to interfere and sacrifice themselves in the process. They did just that, giving Urza just enough time to strike the fatal blow to Gix. Xantcha and Ratepe would be remembered forever for their sacrifice, and Urza went so far as to extrct Xantcha's heartstone as a keepsake. The year is now 3285 AR, the planet's returning back to normal, and Urza has since returned. Far west of the continent of Jamuraa, in the center of the ocean, existed the mythical island of Tolaria. It was here that Urza and Barrin founded the Tolarian Academy. Its purpose was to gather the greatest minds of Dominaria in the hopes of establishing a defense against the impending Phyrexian invasion. 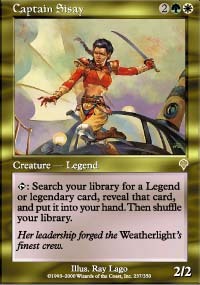 The academy attracted some huge players in the Weatherlight Saga, including Barrin's wife Rayne, Teferi, Jhoira and Ertai. It was at this academy that Urza put into effect the Bloodline Project. This was a grand project of genetic engineering, with the goal of creating the perfect soldiers to defeat the Phyrexian armies. The first wave of creations as a result of this project were called the Metathran, deformed humanoids created en mass as foot soldiers of Urza's army. Rayne was also a result of the project, becoming a headstrong and gifted wizard. She eventually married Barrin, giving birth to the next generation of the Bloodline Project: Hanna. One thing Urza quickly learned of these experiments, was that they needed to happen naturally. Trying to create a human at an accelerated rate was bound to only end in disaster, and so the Bloodline Project was expanded to involve families across Dominaria. This very project would result in the likes of Sisay, Gerrard and Crovax, key players in the coming war. Talking about the Bloodline Project may get confusing, so it's important to remember that there are just as many magical forces at play here as there are scientific. Resources surrounding the academy allowed people, even humans, to live unnaturally long lives, and the experiments conducted at the academy, including the Bloodline Project, had effects reaching far beyond the borders of the island. Beyond the Bloodline Project, Urza had other experiments in the works. One such experiment would be a silver golem created for Urza and Barrin to conduct time travel experiments with, as silver was the only material that could pass through temporal rifts unharmed. He was given life and sentience when Urza built Xantcha's heartstone into him. Urza entrusted the golem to Teferi, a student at the academy, to teach him about the world. Teferi saw the golem as little more than an elaborate toy, and treated him as such, going so far as to name him Arty Shovelhead. Disapproving of Teferi's behavior, it was Jhoira of the Ghitu that took the golem under her own care. She taught him of the world and gave him a proper name. 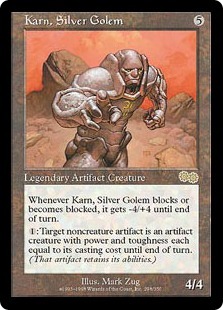 She decided the golem would be called Karn, a Thran word meaning "Mighty". Urza and Barrin continued using Karn for their time traveling exploits and all seemed well at the academy. However, tragedy struck when a Phyrexian sleeper agent murdered Jhoira. Karn used Urza's time machine to return to the past and prevent Jhoira's death. Though he succeeded in doing so, the time machine failed horribly, setting off a temporal reaction destroying the entire academy! About ten years later, Karn, Urza and Barrin returned to the academy to rebuild. There they found that Jhoira was still alive, and that Teferi was trapped in a slow time bubble floating around the ruins. Upon freeing Teferi, it was learned that these temporal anomalies surrounding the now rebuilt academy could be put to use. "Slow Water" taken from certain rifts allowed mortals to live incredibly long lives, and fast time pockets allowed for a millennium's worth of work to be completed in just hours. These findings allowed Urza to even the playing field between Dominaria and Phyrexia, giving them the fighting chance they needed in the impending war. From here, Urza moved to his next project: the Skyship Weatherlight. The Weatherlight was a result of the efforts of nearly every major race on Dominaria. It's frame was built of Thran metal forged by the Viashino of Shiv. It's hull built from the weatherseed supplied by Multani of Yavimaya. The purpose of the Weatherlight was to allow non-planeswalkers to travel between planes, and this goal would require one last piece. Urza traveled back to the now chaotic Serra's realm, bringing the Weatherlight with him. Once there, he rescued as many Serrans as possible before finally collapsing the entire plane into a powerstone, an energy source giving the ship the power it would need to be able to travel between planes without Urza's aid. Urza now had the perfect ship, which would require a perfect crew. This crew would be provided by the Bloodline Project. It was after this successful voyage of the Weatherlight that Jhoira and Teferi bid farewell to the academy, returning to their homelands to help work on the Mana Rig, the device used for the creation of Thran metal and powerstones. No one at the academy felt Jhora's absence as strongly as Karn did. He missed her so greatly, he eventually fell into a deep depression. He tried to involve himself in as many projects as he could so as to ease the pain, but everything he saw only reminded him of Jhoira. Concerned for Karn, Barrin urged Urza to find a way to help. To that end, Urza created a device that would cap Karn's memory, allowing him to remember only 20 years of information at a time. Karn willingly agreed to this procedure, with one caveat; he never wanted to truly forget Jhoira. After limiting his memories, Karn spent every night thereafter with a picture of Jhoira, repeating to himself, "Jhoira is my friend." The academy has been rebuilt, the Weatherlight has been completed, and all the major players are coming together. Urza knows a Phyrexian invasion of Dominaria is on the horizon, and he is prepared. I wanted to take this week to introduce some of the major characters in Dominarian lore, so that I could jump straight into the Phyrexian Invasion next time. There are still some holes to fill and as usual that is intentional. There's a lot to take in, and the last thing I want to do is overwhelm anyone with information, especially when it can get as convoluted as Magic lore. My next lore article will focus on the Weatherlight crew, the Phyrexian invasion and the Coalition, so you'll have plenty to look forward to. The ultimate goal over the next month or so is to work our way up to Mirrodin, so as to shed some light as to why we're there in the first place. I am a little confused whether you are reciting known m:tg 'history' according to various published sources or are creating ties-in where needed. If so, very imaginative, and if not, very succinct. I laughed at "Fowl Play". As did I. Clearly I wasn't over Thanksgiving when I wrote this XD. I have to say that this is the article that made me finally make an account to comment. I love the history of MTG and specifically Dominaria. Thank you for pulling this all together in one place. I can't wait for the next article! All this over +1/+0 and -1/-0. Think what the fuss the Gauntlet of Might would've caused. Good start. I have to say you left out a LOT of details. Such as Urza being nearly killed by Radiant, there is no mention at all about Ashnod, and how Urza and Mishra killed Tocasia fighting with the power stones. I also would like to see, for other readers since I read all the books up to just before the Mirrodin cycle, how and where Phyrxia came from, and who Yawgmoth is. Nice to get a refresher though. Oh, and Tawnos survived the Cylex Blast as well. You're right, I did omit some details (Tocasia dying between Urza and Mishra NOT being one of them) but the real goal with these first few articles is to act as a crash course to get us up to current events. That said, I will be spending more time in the future talking about Phyrexia, namely the next article where I'll need to if I'm going to talk about the Rathi Overlay... which I'm going to.